With the savory and peppery crunch of traditional fried chicken, this Baked Breaded Tofu Chicken Recipe is meat free. Whether you’re looking for a hearty meat substitute, or just a delicious and easy to make tofu recipe, this crispy breaded tofu will definitely hit the spot! He dipped another crispy baked tofu bit in homemade tonkatsu sauce and devoured the whole thing in one bite. “Delicious,” he said – and then tried to high-five me. I grabbed a golden brown nugget and took a bite. The crunch was definitely there. There was a savory and peppery element to the breaded coating that was certainly reminiscent of a good fried chicken. Had I just succeeded in making tofu chicken nuggets? You see, while the outer coating of the breaded tofu most definitely had the indulgent and flavor forward spice mix you might expect from fried chicken, the interior was unabashedly bean curd. And I’m good with that! With so many great mock chicken products out there, my goal that day wasn’t to recreate the taste and texture of chicken. It was to just make a yummy tofu recipe! The fact that the breading was reminiscent of fried chicken was great (and delicious!). Maybe tofu chicken isn’t a complete misnomer after all. No secret – I’m a BIG tofu fan! 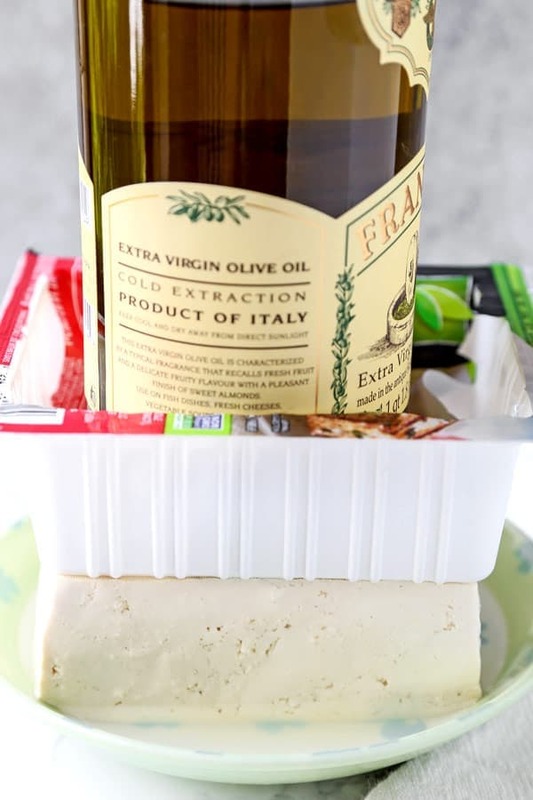 Whether making a fried tofu recipe, like the Japanese izakaya favorite agedashi tofu – or using it as the creamy element in a healthy salad dressing, I just can’t get enough of the humble bean curd. I developed a taste for silken tofu on my frequent trips to Japan as a kid with my family. There was nothing I loved more than a cube of fresh tofu topped with katsuobushi, scallions, ginger and a little soy sauce. I got more and more into cooking with both silken and firm tofu later in life. Firm tofu really stands up to the perils of stir frying and deep frying. While this breaded tofu recipe has the indulgent flavors and texture you’d usually get from a deep fried tofu recipe, it is baked and is, therefore, lighter and healthier. But doesn’t taste that way. Yep – there is a serious meaty and savory indulgence in every bite of these breaded tofu nuggets! Tofu (bean curd) is derived from soybeans. It is made by curdling soy milk with a coagulant and then pressing the curds into soft yet solid white blocks. You’ll see tofu used a ton in Asian recipes. It also shows up a lot in vegetarian cooking as a protein rich substitute for meat. Sure, something like tofu steaks can sure sound like a bit of a mishmash of ideas. But tofu is a wonderful blank slate from a flavor perspective. When cooking with bean curd, you dictate the resulting flavor 100%. Therefore, it can be quite liberating to work with an ingredient that bends to the will of the chef’s flavor whims. 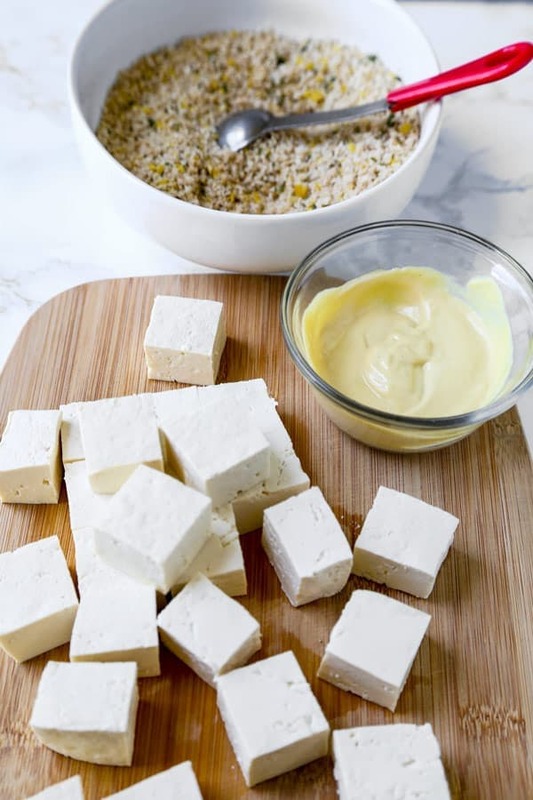 If you’re looking for a super in-depth breakdown on tofu, along with how to cook most types of bean curd – and a TON of recipes – check out my post 29 Tofu Recipes That Will Make You Rethink Meat. There are a ton of different ways to cook tofu. Seriously, it’s wonderful pan-fried, deep-fried, grilled – or boiled in a spicy broth when making Japanese hot pot. It’s delicious smoked, stir-fried or baked. The method you choose just depends on the result you’re looking to achieve. And, while deep-fried tofu tends to be one of the most indulgent tasting of these myriad preparations, it isn’t always the healthiest. Now, I’ve baked tofu many times before, but I’ve never had it turn out quite as perfectly crispy as these breaded tofu cubes were. It’s a pleasant surprise when a little old fashioned trial and error returns results you weren’t quite expecting in the kitchen. Heck – any recipe that returns crispy results without the terrifying need of precariously balancing a pot of boiling oil on a stove-top burner is a win in my book as well! When you don’t feel like frying, baking tofu can return some crispy, crunchy results. And I’ve assembled an easy checklist. If you’re using firm or extra firm tofu, you’re going to want to make sure the water it is packed with is properly extracted. Using a tofu press is a great way to rid your block of bean curd of excess moisture. Alternatively, you can top your tofu block with a plate and press under a couple heavy books. Use a breading like panko breadcrumbs to impart an unreal crunch. Make sure that breading sticks! In the case of these breaded tofu chicken nuggets, I applied a creamy element on the outside, and then used it to adhere my panko breading. An egg wash would work in a pinch though. When it comes to baking, make sure your tofu bits are evenly spaced on the sheet pan, and not bunched together. The secret to making tofu that tastes like chicken is all in the breading. Most fried chicken recipes call for a significant amount of flavor to be added to the outer coating. So – while the coating is busy providing a crunchy exterior to the protein, it’s also delivering heaps of assertive flavor in the process. Kinda cool how that works! In the case of this healthier and delicious baked and breaded tofu chicken recipe, I mixed equal parts mayo and dijon mustard to act as a binder for the spice mix. Vegans – just use vegan mayo! Then, in a separate bowl, I mixed together panko breadcrumbs, nutritional yeast, paprika, garlic powder, dry parsley, salt and pepper – and gave it all a good dry stir with a fork. After coating my firm tofu cubes in the creamy mayo/dijon mixture, I gave them a hearty dunk in the spiced breadcrumb blend. I was super careful to make sure each cube was evenly coated with the umami loaded breading. Then into the oven they went! I baked them at 400°F for about 30 minutes – and let them rest for a good five minutes afterwards to cool slightly. The resulting nuggets were crunchy, savory and – yep – reminiscent of a delicious fried chicken nugget. Sure, that full frontal flavor attack came from a combination of the spices. But, let’s not forget to mention my secret flavor weapon here: nutritional yeast. Unfortunate name aside, nutritional yeast (sometimes called nooch) is a yellow powdered or flaked inactive yeast. There’s a cheesy nuttiness to it that almost borders on umami. Seriously – Bon Appetit calls it nature’s Cheeto dust. Since it is a vegan food, it’s an amazing substitute in recipes that call for cheese – or just happen to need an extra hit of savory goodness. And as the name suggests, it’s loaded with tons of good stuff your body needs: B vitamins, zinc, folic acid, selenium and protein. It also happens to be the secret flavor ingredient in this baked breaded tofu chicken recipe. You see, along with the paprika, garlic, salt and pepper used in the breaded coating – nutritional yeast goes into the mix. And it helps round the flavor profile into something containing the soulful umami that meat sometimes has. These breaded tofu nuggets would be tasty on their own. However with a bit of nutritional yeast in the breading mixture, they become almost… chickeny. Even though I’m adamant that this is a tofu recipe first and foremost, I will concede that there are some yummy flavor elements of fried chicken at play. Food is such a fun thing to experiment with and bend to your particular palate. The result is that these chickeny baked tofu bites have become one of my favorite extra firm tofu recipes of all time! You see, I used real mayonnaise in my recipe the first time. Mixed with dijon mustard, the mayo is used as a binder for our breadcrumbs mixture. As I mentioned though, a super easy solution to make this recipe completely vegan is to grab a vegan mayonnaise substitute and use that instead. I used vegan mayo the second time I made this recipe. And it worked like a dream! But, no matter which mayo you use, I just KNOW you’ll be pleasantly surprised at how much flavor these little tofu nuggets pack. What’s a dish you’ve made that has some of the flavors of a different iconic recipe? I’d love to hear about it in the comments! Did you like this Baked Breaded Tofu Chicken Recipe? Are there changes you made that you would like to share? Share your tips and recommendations in the comments section below! 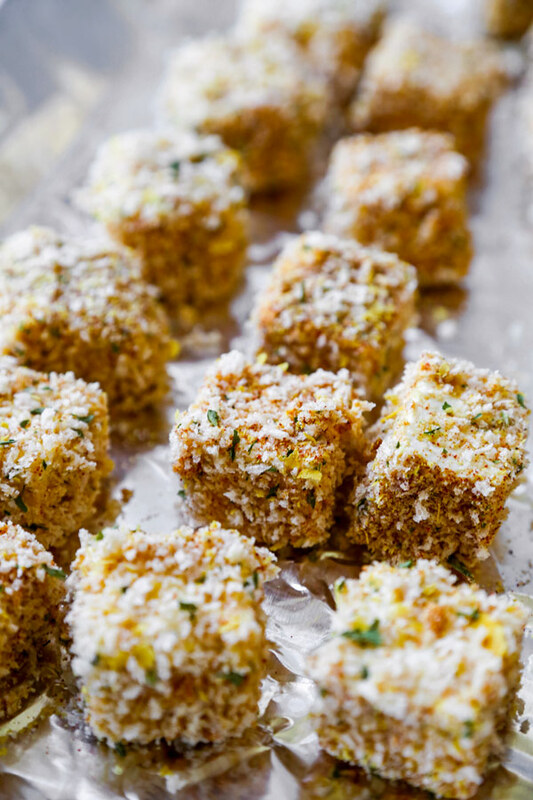 Crispy oven baked tofu cubes with Italian flavors. Place tofu on a plate or a in a bowl and top with a heavy object to drain the excess water. Leave for 15 minutes. Meanwhile, mix mayonnaise and dijon mustard in a bowl and set aside. In a separate bowl, combine breadcrumbs, nutritional yeast, paprika, garlic powder, dry parsley, salt and pepper. Drain the tofu and pat dry with a paper towel. Slice tofu into 1/2-inch cubes. One by one, coat the tofu cubes in the mayo/dijon sauce and then coat in the breadcrumb mixture. Lightly press to make the breadcrumbs stick. 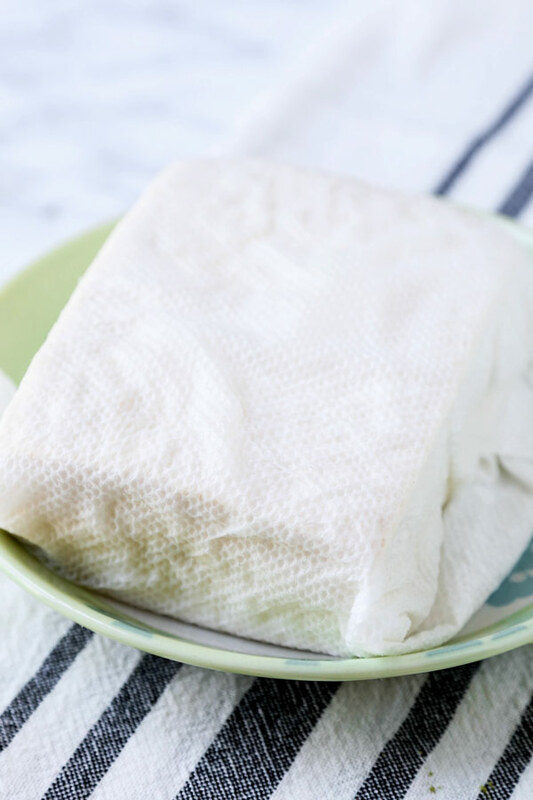 Place tofu cubes on a cooking tray covered with non-stick foil or parchment paper. I’m trying these tonight! Look delicious and super easy.